"The Grand Canyon fills me with awe. absolutely unparalleled throughout the wide world." PLANE: Commercial air carriers serve Las Vegas (278 miles), Phoenix (231 miles), Flagstaff (80 miles), and Grand Canyon Airport (in Tusayan, just south of the park). GETTING AROUND - FROM SOUTH RIM: Free shuttle service is available year round throughout Grand Canyon Village and out to the South Kaibab Trailhead. March - November free shuttle service is available along Hermit Road. When the Hermits Rest shuttle bus is running, Hermit Road is closed to private vehicles. FEES/PERMITS: All private vehicles entering the Grand Canyon must pay a $25 entrance fee, which is good for seven days. These shuttle buses operate on three routes. The routes interconnect, but do not overlap. The free shuttle buses take you to places in the park you cannot drive. Park your vehicle in one of the parking areas, proceed to the nearest bus stop, and board the next bus. Information about bus routes is available on the map (that you may download above) and at bus stops. Buses display the route name on the front marquee. It is that simple. The buses come by every 15–30 minutes. You are free to get on and off at any stop. 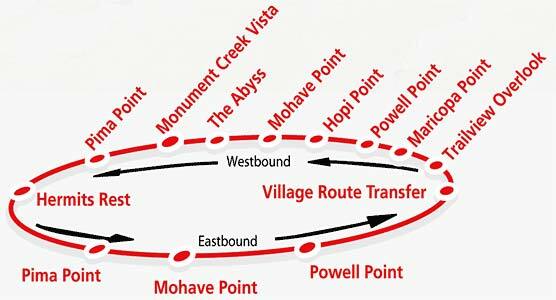 The routes are designed so you can ride to a stop, enjoy the view, shop at a gift store, or walk along the rim and then hop on a later shuttle. This is not a scenic route, but rim views are available a short walk from some stops. How often does the bus come ? This is the shortest scenic route and the only access to Yaki Point, the South Kaibab Trailhead and the Yavapai Geology Museum. Shuttle bus service on Hermit Road provides transportation between the Village Route Transfer Station and Hermits Rest (7 miles/ 11 km) with stops at nine canyon overlooks. People often get on and ride this without getting off --- takes 75 minutes. This bus route may be used in conjunction with the rim trail. It is possible to get off at one stop, enjoy a scenic walk along the rim - then get back on the bus at the next stop. 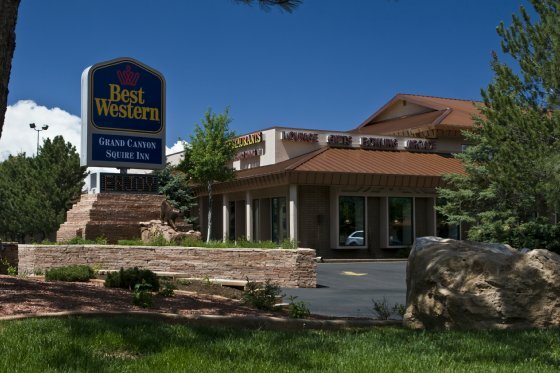 Situated in Williams, Grand Canyon Railway Hotel is in the historical district and close to Elk Ridge Ski Area. 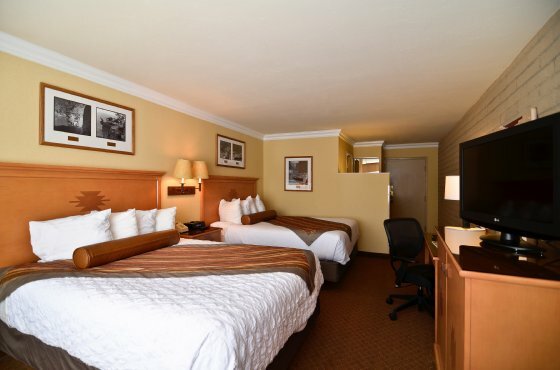 The Canyon Plaza Resort is 10 minutes from the rim of the Grand Canyon, 5 minutes from the entrance to the Grand Canyon Park and the Grand Canyon Airport. The Grand Hotel is in located on US Hwy 64 in Grand Canyon Village, Arizona, 1 mile from the Grand Canyon National Park's entrance, and less than 7 miles from the South Rim Visitor Center.